Great review, V. I saw this yonks ago, and really liked the ‘mistaken identity’ angle. Then again, Stanwyck was always pretty good. The idea was sort-of revived in the Sndra Bullock film, ‘While you were sleeping’, but more ‘feel-good’ of course. Stanwyck was a powerhouse. The mistaken identity part was the best area. I need to make time for blogathons. What a cool write up. Oh you’ll do some good reviews, I know it. That’s very kind. I have read more and seen more films this year. I think you’ll do well on my latest quiz too, teenagers. I’m planning to see a lot more movies. Goodreview V-man, wasn’t keen on Stanwyck even though she was a good actress. Thanks for for the comment. Any reason you weren’t fussed on her? 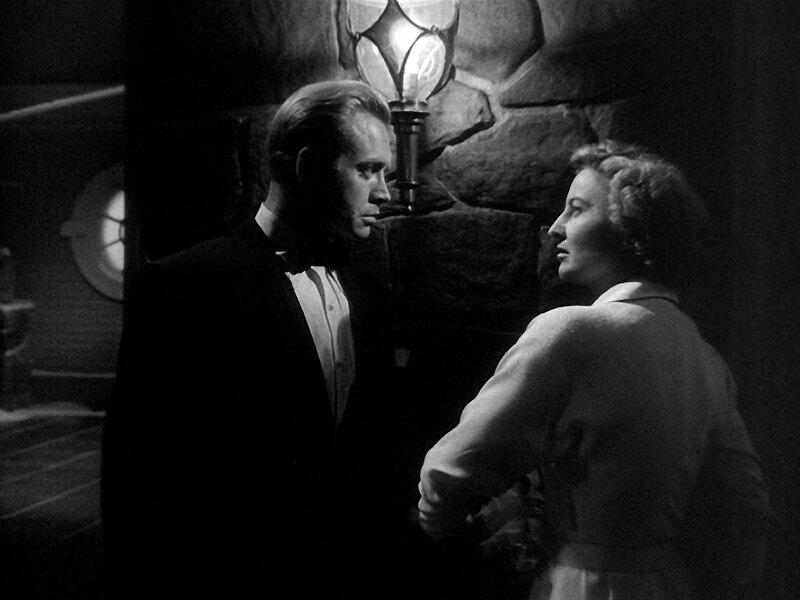 Of all of the Cornell Woolrich screen adaptations, for me, this movie comes closest to capturing the mood of the novel I Married a Dead Man. Great atmosphere. 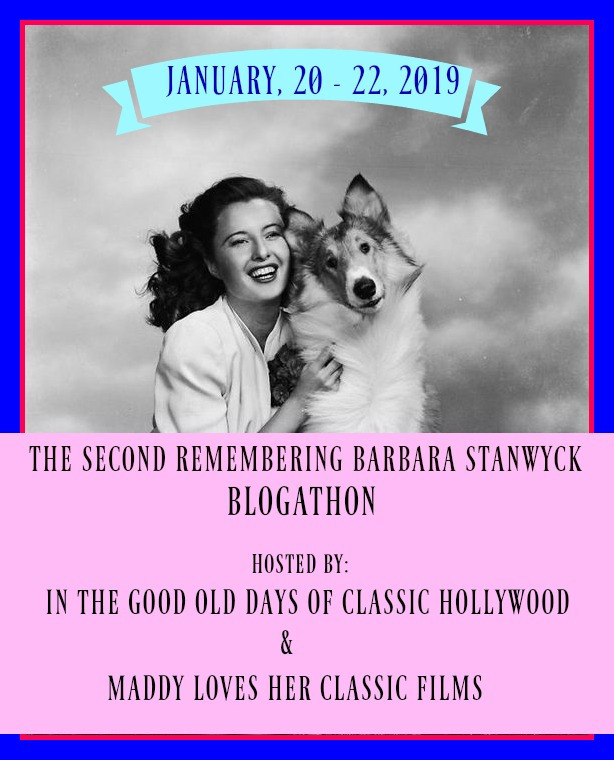 Great choice for a blogathon highlighting Barbara Stanwyck. Thanks for commenting. Stanwyck was the best thing about this movie. She completely gives it all to her part. You can see that she was a real professional. Nice review of a very underrated movie. The combination of Noir and woman’s picture works actually amazingly well. The movie is quite different from the Woolrich novel on which it is based. The book, titled I Married a Dead Man, is very dark, and of course doesn’t have the happy ending. The movie doesn’t go for the abject Nihilism of the book which is fine with me though a bit less sentimentality would have been good occasionally. Lyle Bettger makes for a great bad guy. I was surprised how well both genres worked together. Bettger was one slimy bad guy and Stanwyck gave it her all. All the Barbara you can Stan-wyck! I’m here all week! Try the veal. And tip your bartenders! 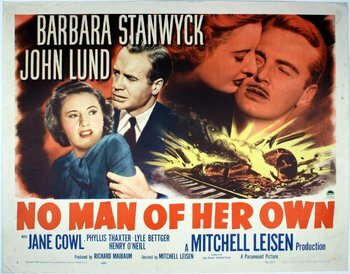 This is one of Stanwyck’s films I have yet to see. But you’ve convinced me I should! Stanwyck knocks it out the park, like she always does. Great review of a film that I have yet to see. Sounds very interesting indeed. It sounds like Barbara is the main reason to check this flick out. Thanks for joining our blogathon. Stanwyck is the best part of this movie. Thank you so much for inviting me to partake. Hope you’re feeling better. Thanks for taking part in the blogathon. I love this movie. I would actually say its one of my favorite Barbara movies, but unfortunately its quite underrated. You have done this film justice though with your excellent article. I was happy to take part. I’ll check my schedule to see if I can take part in the other blogathon.